Most people know that owning a dog has some responsibilities that come along with it, the most important ones being: keep the dog fed and take the time out of your day to go on a nice walk. Knowing the US, there’s a category of people that want a dog, but don’t feel like going walking everyday. For those of you lazy people out there that fall into that category, you should do your dog a favor and get him/her the Doggy Treadmill. And yes, I think this is the most ridiculous pet gadget I’ve ever seen. Ever, I swear. 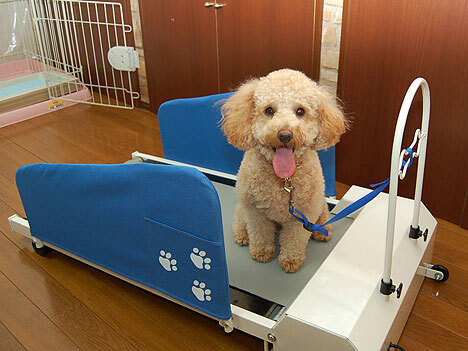 Just think, if you get yourself a real treadmill, you and your dog could exercise together. Aww, it would be a great Christmas Card. There’s no real way to force your dog to go onto the treadmill though, you could tie the leash to it, but still, eventually old Sparky will figure out how to get off (or at the very least how to stay to one side). I’d definitely be tempted to put some tasty treat just in front of the treadmill and see what happens. I’ve been making fun of this contraption high quality piece of exercise equipment, but it may have one use that seems practical, for when it rains. But dogs love rain, and there is such a thing as an umbrella. I can’t find any pricing information, not that anyone would want to buy this because it would probably be extremely expensive, and you’re better off going outside (eek!) and getting a bit exercise (and fresh air) for you and your dog. Jane! Stop this crazy thing. I actually think this could be useful for the elderly or disabled who haven’t got the means to take their dog out for a walk. Though I must admit I reckon a big hamster ball would be more fun. I wish I’d had one of these last year!!! My terriers were used to a good run. After I had a severe knee injury, they were the ones that suffered the most. With me on crutches for 2 months and PT for awhile after that, we all would have benefited from owning one. This is a great idea but I don’t like seeing the dog tied to the contraption, what if it fell? It is the most ridiculous, but hey, how cute is it. I am certain, just for the cute factor this product will be success.